The Texas Rangers visit Rogers Centre on Wednesday to play the Toronto Blue Jays. The probable starters are Colby Lewis for the Rangers and Aaron Sanchez for the Blue Jays. The opening line for this matchup has Texas at +165 and Toronto at -175. The over/under was set at 9. The Rangers have a 12-13-1 over/under record and a 14-12-0 run line mark, meaning they cover 54% of the time. The Blue Jays are 14-13-0 against the run line and have a 8-17-2 over/under record. They cover the spread 52% of the time. The Rangers head into this matchup with a 15-11 record, including 5-6 on the road. Starting pitcher Colby Lewis has a 2-0 record with an earned run average of 3.19 and a WHIP of 1.45. He has 20 strikeouts over his 31 innings pitched and he has given up 35 hits so far this season. He has allowed 10.2 hits per 9 innings and he has a FIP of 5.78. The bullpen this year has an earned run average of 4.88 and they have given up 83 base hits on the year. Teams are hitting .277 against the bullpen while being struck out 63 times and walking 24 times this season. As a team, Texas has allowed 8.59 hits per nine innings while striking out 6.69 batters per nine. They are 11th in the league in team earned run average at 3.71. The Rangers pitchers have collectively given up 222 base hits and 96 earned runs. They have allowed 36 home runs this season and they allow 1.4 homers per nine innings as a staff. Texas as a pitching staff has walked 85 batters and struck out 173. They walk 3.3 men per 9 innings while striking out 6.7 per 9. They have a team WHIP of 1.32 and their FIP as a unit is 4.84. As a team, Texas is batting .257, good for 10th in the league while putting together a .239 average away from home. The Rangers hold a .397 team slugging percentage and an on-base percentage of .317 which is good for 13th in baseball. They rank 12th in baseball with 8.5 hits per game. Adrian Beltre comes into this game hitting .289 and his on-base percentage is at .343. He has 28 hits this season along with 11 runs scored and 15 runs batted in. He's struck out 10 times and has walked 9 times. Elvis Andrus is hitting .310 and he has an on-base percentage of .341. He has totaled 26 hits so far while scoring 8 runs and he's driven in 13. He has walked 5 times and has struck out 10 times. The Rangers have 221 hits, including 48 doubles and 22 home runs. They've stolen 13 bases while they've been thrown out stealing 8 times. Texas has walked 69 times this season and they've struck out 189 times as a unit. They've left 158 men on base and have a team OPS of .714. They score 4.38 runs per contest and have scored a total of 114 runs so far this year. Toronto comes into this matchup with a 5-8 home record and a 12-15 overall mark. With an earned run average of 2.59, Aaron Sanchez has a 2-1 record and a 1.15 WHIP. He has 29 strikeouts over the 31.1 innings he's pitched during which he has given up 26 hits. He has allowed 7.5 hits per nine innings and his FIP stands at 3.52. So far this season the bullpen has an earned run average of 4.01 and they have given up 70 base hits on the year. Teams are hitting .262 against the Blue Jays bullpen while being struck out 68 times and walking 21 times this season. As a team, Toronto has allowed 8.41 hits per nine innings while striking out 7.57 batters per nine. They are 10th in the league in team earned run average at 3.71. The Blue Jays pitchers as a team have surrendered 222 base knocks and 98 earned runs so far this season. They have given up 27 home runs this year and they give up 1 home runs per nine innings as a staff. Toronto as a staff has walked 79 hitters and struck out 200. They give up a walk 3 times per 9 innings while they strike out 7.6 per 9. Their team WHIP is 1.27 while their FIP as a staff is 3.98. As a team, they are batting .229, good for 27th in the league while putting together a .248 average at home. The Blue Jays hold a .390 team slugging percentage and an on-base percentage of .313 which is good for 18th in baseball. They rank 27th in baseball with 7.48 hits per contest. Josh Donaldson comes into this matchup batting .291 and he has an OBP of .387. He has 30 hits this year along with 26 runs scored and 21 RBI. He's struck out 27 times and has walked on 14 occasions. Jose Bautista is hitting .231 and he has an OBP of .374. He has collected 21 hits so far while he's scored 16 runs and drove in 18. He has earned a walk 22 times and has punched out 25 times. 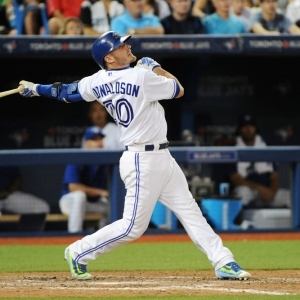 The Blue Jays as a unit have 202 base hits, including 43 doubles and 31 homers. They have 9 stolen bases while they've been thrown out 4 times. Toronto as a team has walked 98 times this year and they have struck out 250 times. They've had 173 men left on base and have an OPS of .703. They score 3.93 runs per game and have totaled 106 runs so far this season.